Are you looking for an executive CV writing service? Here are some guidelines – and a short-cut direct to personal, one-on-one done-for-you CV and LinkedIn help. Do you identify with this stuff? Let’s get it sorted. So, here’s a shortcut: call me now. I’m giving you my personal mobile phone number: +27 83 744 5454 (it’s in South Africa, but my clients are worldwide). Call any time. I’ll answer (mostly – unless I’m on the squash court, or in a meeting), otherwise Whatsapp me or send me an email. I’m at gerard@wowcv.net. Let’s chat about what you need and how I can help. And you can get a feel for what I do, how I do it, and how I can get you the result you need. Right, that’s your executive CV writing service shortcut. 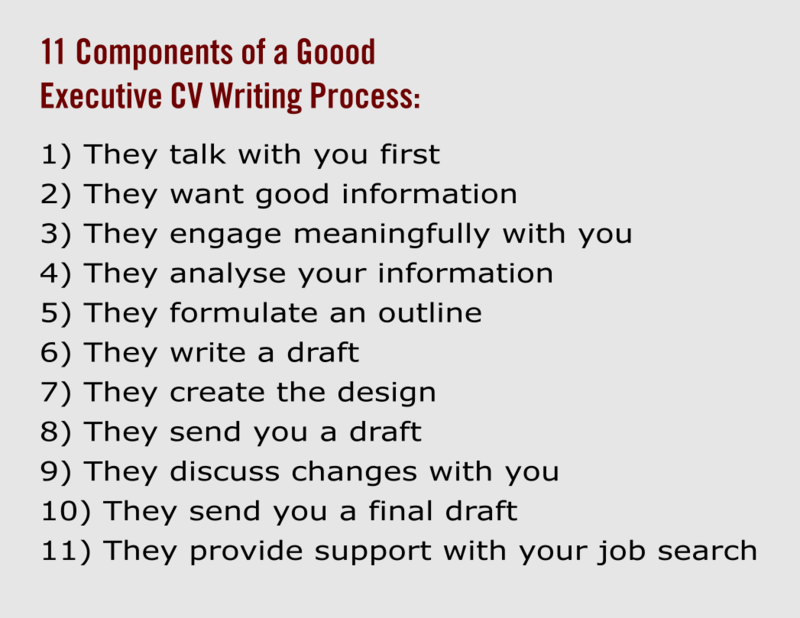 Now, let’s dig into some often asked questions and points you need to know about using an executive CV writing service. Yeah, so you really do want to be dealing with someone personally. And that person should have some corporate experience, should understand what you do. They should have a good grip on what a Board or Exco, a CEO, CFO or COO looks for when selecting a new senior manager or fellow executive. Sometimes it’s hard to figure this out when looking at all the executive CV writing service options. They all seem to say the same thing, claiming to be the experts. The best remedy, I think, in this scenario is to give them a call, or send an email. Then check the response. Who do you end up dealing with? How do they sound? Do you end up with the CV writing service owner/manager who will just pass your job on to their ‘typing pool’ staff? Or will they serve you personally? Will you be writing my CV? What are the special challenges of writing an executive level CV? What’s your CV writing philosophy / approach? Allow them to speak. You’re not looking for a particular answer. You’re just listening to hear whether they sound like they know what they’re talking about. Do they have a definite process and approach for executive level people? Do they understand your ‘world’? Some CV writing services, even executive CV writing services, are really no different to a regular CV writing service.They may claim to be specialist. But I’ve seen examples of some of their work, and it’s pretty disappointing to see that they’ve just rehashed the old CV. Yes, they’ve tidied the formatting up. Yes, they’ve corrected some spelling mistakes. But clearly the CV writer is not sufficiently skilled or knowledgeable to simplify, prioritise, re-design or rewrite the document. They include standard cliches such as “Experienced high level executive with demonstrated expertise in…” Ah, cummon! That is so lame. They talk to you before undertaking the project – just to be sure that you and they are on the ‘same page’ with respect to what needs to happen, that you’re a good match to work together. Their information requirements are extensive – they will look for a list of items such as 360 degree feedback reports, leadership / personality profiles, performance appraisals, testimonials or references; and they will ask questions such as: “what are some ‘against the run of play’ successes you’ve had?” and they’ll dig deeper by asking, “what makes you great at what you do?” They ’ll try to get a deep sense of what value you bring to the table, or your brand of leadership. They’ll want to understand the context you worked in – budgets sizes, size of teams, who you reported to, what growth you achieved, what you saved, what innovation you introduced, etc. This kind of information is very compelling. It provides a clear picture. It leaves no question marks (in the mind of the future employer), it builds trust, it’s persuasive. They engage with you personally when gathering information – yeah, you really want it all to happen one-to-one, not necessarily face-to-face, that’s overrated, but definitely you want to be sure there is a personal and open line of communication, in order to get it all right. Once you’ve provided all the information you can, the ball will be in the executive CV writer’s ‘court’. They will study and analyse your info, draw up an outline of what information items should be prioritised, what needs to be featured, how you need to be positioned, what potential employers are likely looking for, they’ll formulate some hard hitting, strong and clear statements of who you are and why you’re a great resource to have in a business, what difference you can make. They’ll write the copy, figure out how to format and layout the CV so as to make it readable and for the right elements to stand out. Perhaps they’ll include a picture (it has to be the right one!) and build a colour scheme around it. Or perhaps they’ll create a graphic to include that really encapsulates what you do and to add visual interest. They’ll put a draft together. They’ll send you a draft. This draft will actually be quite complete, but obviously subject to your comments, corrections and questions. This can happen via a phone discussion or via email, or you can make changes in the MS Word version, or insert your comments in the PDF. The aim being to refine the draft. And then the final draft will be sent to you in MS Word (something you can edit) and PDF. Of course a CV is never really complete, it has to change slightly with almost every application you make, just shifting focus a little here and there to ensure you match with the needs of the position advertised. Your executive CV writing service should provide support in this respect. BEFORE YOU GO ON, you may want to just give me a call to see how I can assist you. Use this short-cut: my personal mobile phone number is +27 83 744 5454 (it’s in South Africa, but my clients are worldwide). Call any time. Or send me an email. I’m at gerard@wowcv.net. Fees vary. And for good reason. On the one hand there’s a real need for a basic CV writing service, many people just cannot do even the most basic CV for themselves. The result is terrible. And so, it’s great to have some CV writing services to cater to that part of the market. The problem is when these services start thinking that they are better than they are and they start charging big fees and start stating that they are executive CV writing services, when actually they are no such thing. What you need is someone experienced in the corporate world, someone educated sufficiently to know how to write and understand complex terminology and concepts, someone who can communicate confidently at your senior management level, someone who can write well, someone who is a student of marketing and copywriting, and someone who has some graphic design skills. This kind of combination of skills doesn’t come cheap. So, you have to realise that the cheaper the service, the less chance there is of getting a product written by a genuine executive CV writer or executive CV writing service. MY fees range from USD100 / ZAR1500 (junior level, “wow” CV) up to USD350 / ZAR5000 (top level earners, senior leaders) – again, depending on what you need. How to enlist my help: send me your existing CV and then let’s talk – and I’ll also send you my table of fees and service details. I’m on +27 83 744 5454 or gerard@wowcv.net. It will take time. Usually a high quality executive CV writing service is not a ‘sausage machine’ churning out the production within predictable timeframes and in high volume. It’s a creative process, not a ‘fill in a template’ or ‘paint by numbers’ process. Both from a writing and a design point of view. A CV written by anyone else than YOU can never be as authentic as if would be if written by you. Right, so, you can write your CV yourself. There are good reasons to do this. But it can be frustrating and end up with a mediocre result. Or you can use a cheapish service and get something perhaps quite tidy, but not so different to what you’ve got right now. Certainly it won’t be value adding, there’ll be no branding, it won’t differentiate you in the market. Or you can pop your info into a machine online and it will spit out your CV with a good looking format, but the document won’t hang together well, won’t be written any better than you write and will likely look quite ‘plastic’. Or you can enlist an executive CV writing service, preferably an executive CV writing service which encompasses someone experienced in the corporate world, is a skilled copywriter and graphic designer and who is a student of marketing and advertising. If you’d like to have a chat about what you need, I’m here for you. GIVE ME A CALL on +27 83 744 5454 (my personal mobile) or email me on gerard@wowcv.net. I can get it done for you. Just a warning, I actually don’t accept working with everyone. But perhaps send your old CV to me, then let’s set up a discussion to see if we’re a match to work together.